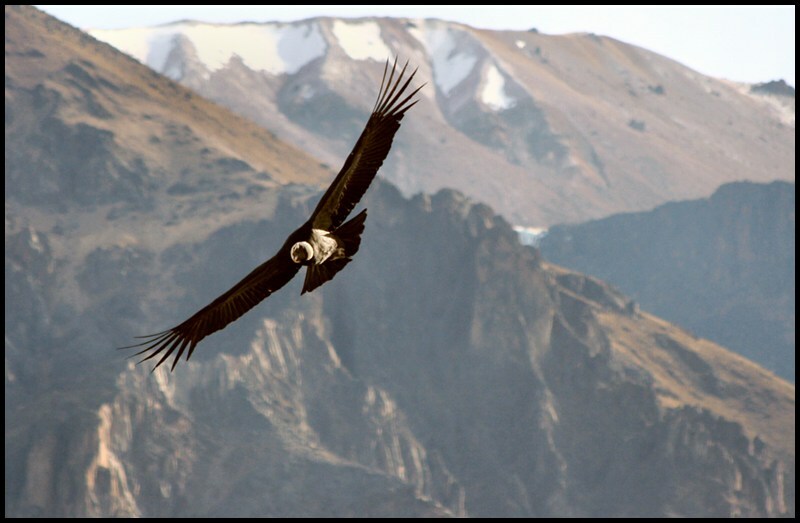 Welcome to the June edition of the Visit South America series! This is a monthly contributed post on traveling to South America, in preparation for my 2-year backpacking trip there starting August 2015. For this month, Inga and Florian of The Travelling Monkeys will show us what their favorite things are on Easter Island, South America’s most remote destination! 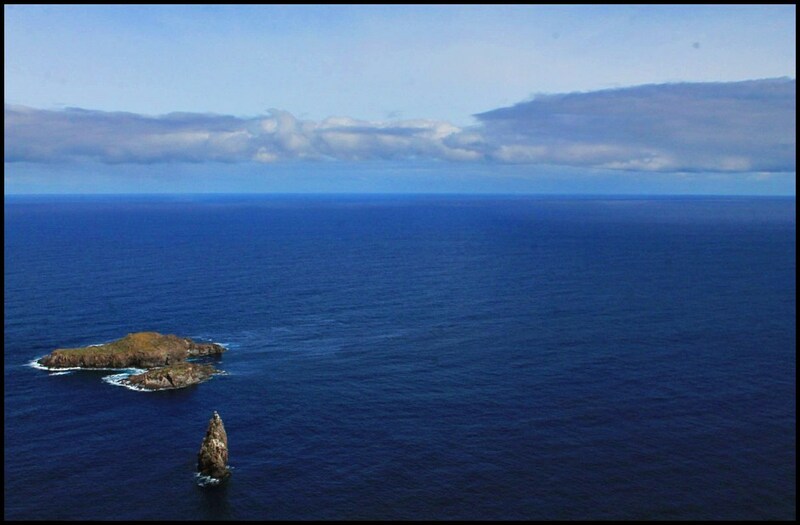 Rapa Nui, better known as Easter Island or Isla de Pascua, is one of the most remote inhabited places in the world. Politically, it belongs to Chile despite the six-hour flight that separates the island from its motherland. Geographically, it marks the most southeastern point of the Polynesian Triangle. Its closest inhabited neighbor is Pitcairn Island, located “only” 2,075 kilometers to the west. Nevertheless, almost everybody has heard of Easter Island. 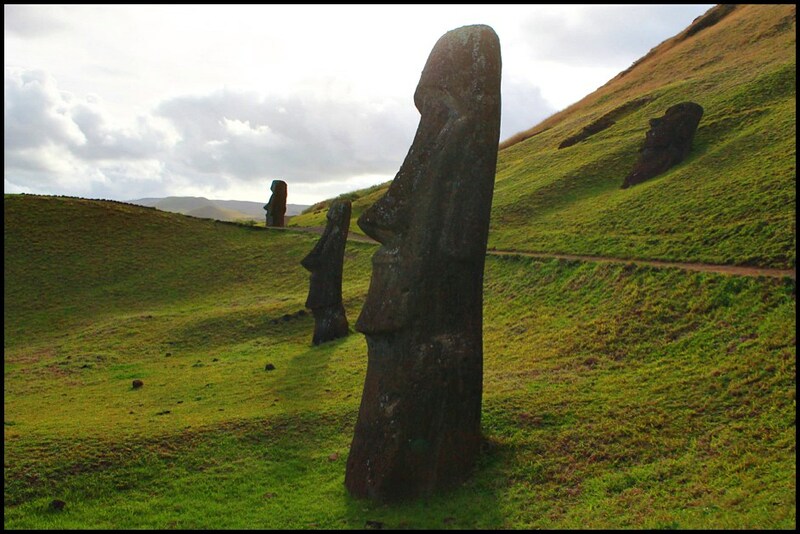 It is famous due to the impressive Moai statues, massive stone figures which were created by natives centuries ago. The Moais of Easter Island. 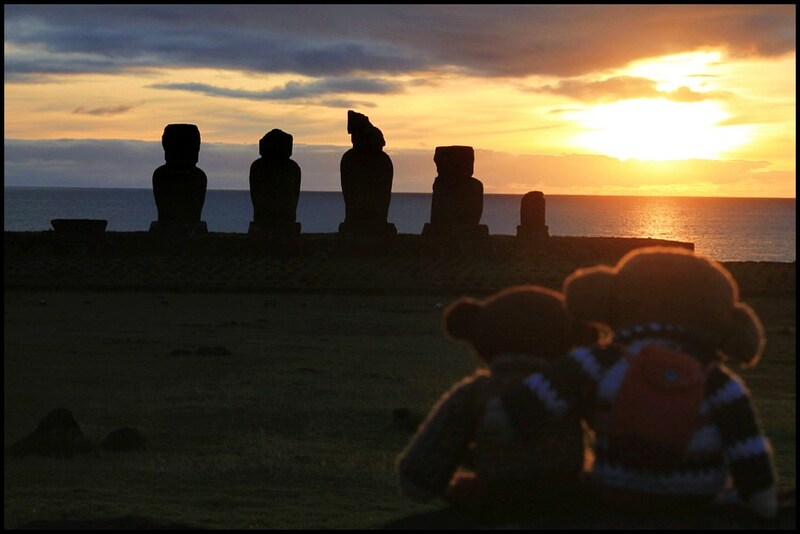 Bimbino and Bambina had been dreaming of visiting Easter Island for a long time. Before actually going there, the Travelling Monkeys wondered if such a small and remote island was really worth visiting. Such a long journey just to see a few statues? After having spent one week on Easter Island the Monkeys can answer that question in a single word: TOTALLY. 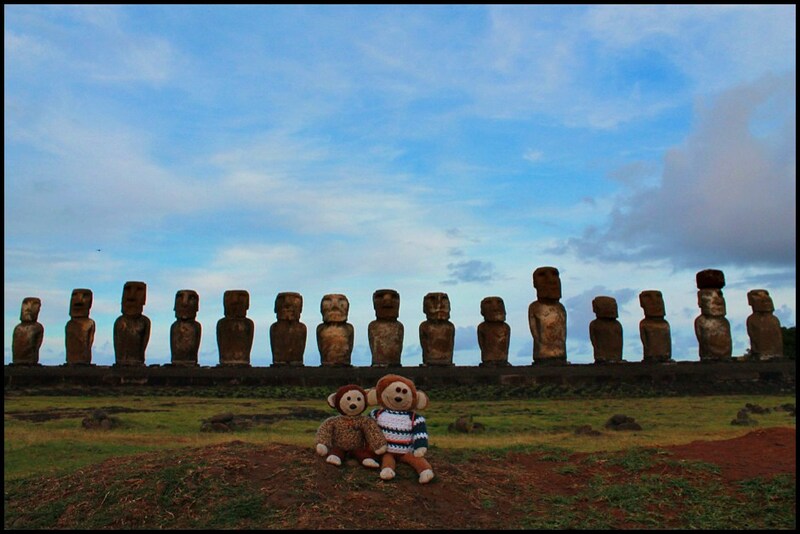 Here are the Travelling Monkeys’ favorite things on Rapa Nui. The feeling of being in the middle of nowhere struck Bimbino and Bambina the moment they stepped out of the plane. They arrived in one of the most remote inhabited places on Earth; the next village was more than 2,000 km away. Easter Island is a remote destination in South America. But when the monkeys climbed to the top of one of the volcanoes, it completely overwhelmed them. Looking out over the ocean and realizing how small a part of the world they were made them sit in silence for a couple of hours. 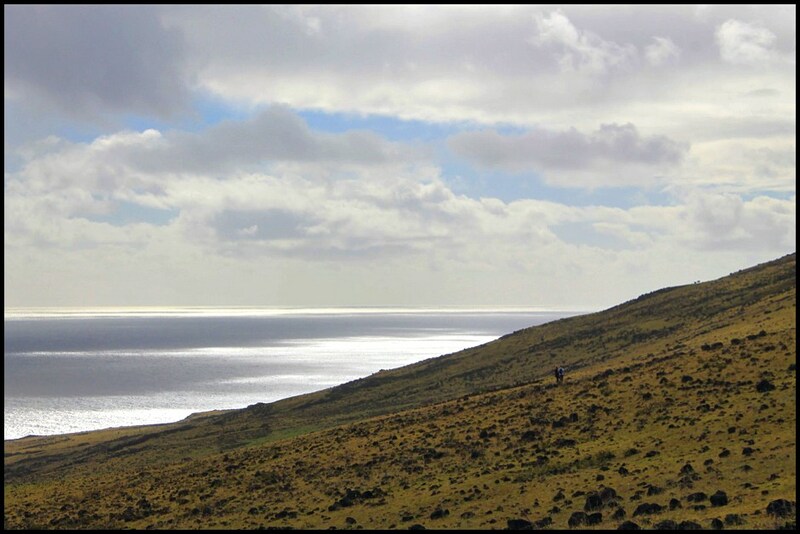 Rapa Nui is a volcanic island formed by three major volcanoes and many small ones. 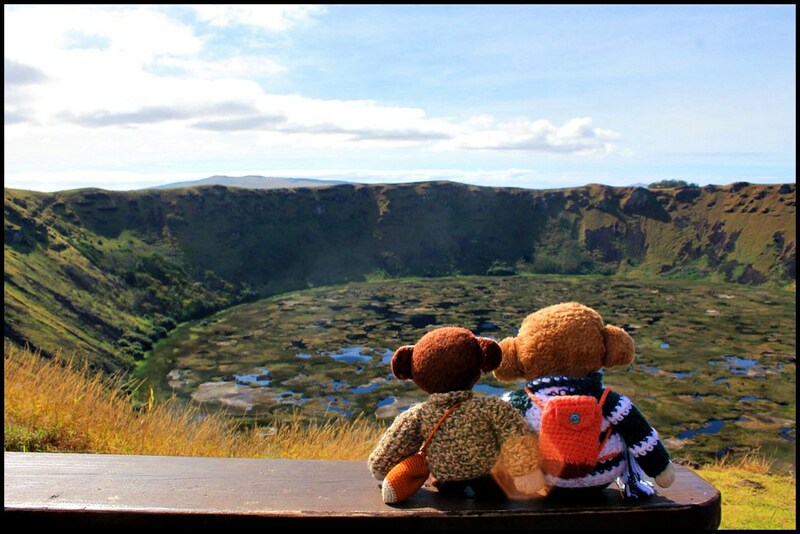 It was the first time that the Travelling Monkeys had seen a real volcano crater. Even though the volcanoes have been extinct for thousands of years, and the craters look more like lagoons, it was still impressive to sit at the edge of the massive Rano Kau. The crater of Rano Kau. Another crater, Rano Raraku, is rather small, but its colors are striking. If you come at the time when the coral trees (Erythrina) are in bloom, you will be stunned by the combination of the orange sand, green grass, blue sky, and red flowers. 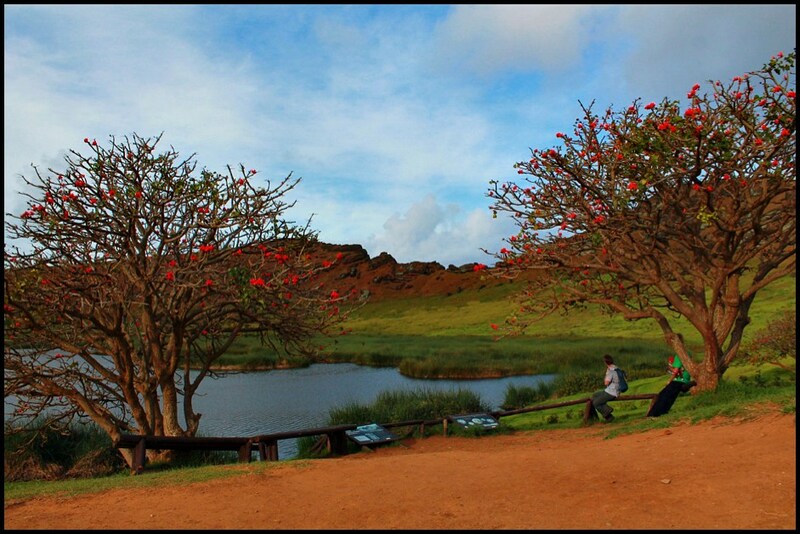 Rano Raraku crater is small but picturesque. It is impossible to become bored of meeting the sunsets on Easter Island. The game of the sun, the ocean, the clouds, the rainfalls, and the Moais is every single day a unique and majestic performance. The weather on Easter Island can be very unpredictable: one minute the sun is shining, the next it is covered by a thick dark cloud and the rain is pouring down. However, as fast as the rain begins, it also stops, and then comes rainbow time. On one of their days on the island, Bimbino and Bambina could see one rainbow after another, almost every hour! You can have your fill of rainbows here! Easter Island is so small that you can walk from one side to the other and back in one day. The Travelling Monkeys went for a day hike along the western coast of the island, where few tourists go, aiming to reach one of the two beaches and go for a swim. Walk, walk, and walk some more on Easter Island. They took it easy, stopping a lot on the way, visiting old caves where Rapa Nui people used to live and carry out religious rituals, looking at the ocean, enjoying the silence and the nature. They walked and walked and walked… it took the monkeys eight hours instead of the planned six. It was exhausting, but absolutely rewarding. The ocean is furious; it seeks to destroy the rocks in its way. In its attempts, the water splashes over the rocks in vast majestic fountains — a masterpiece of nature you could sit and watch forever. 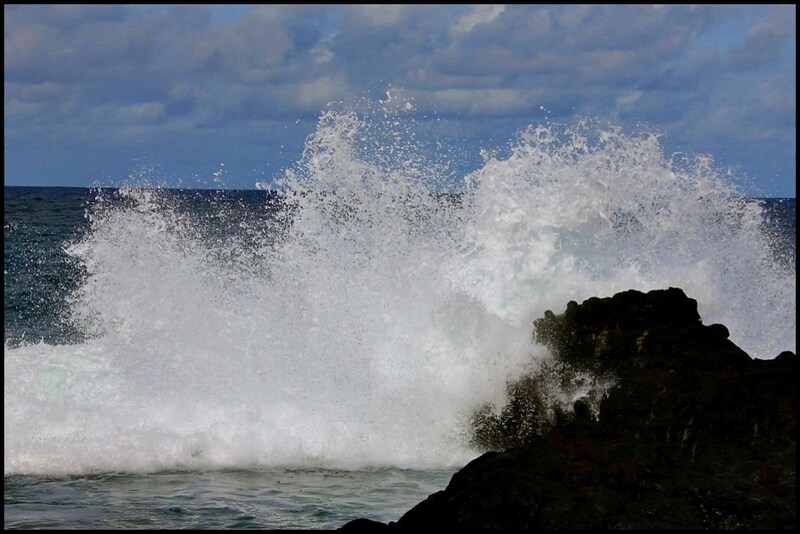 Waves batter the coast of Rapa Nui. 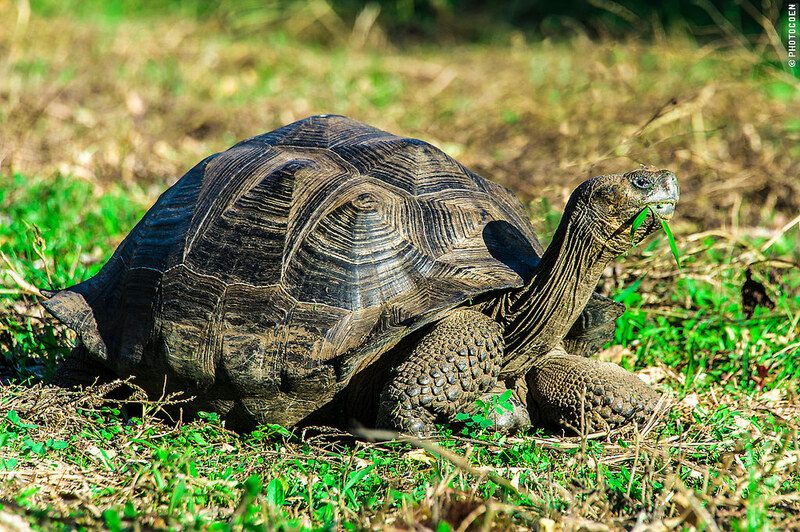 The wildlife of the Easter Island is rather scarce. There is not much space for big animals to breed; therefore, the only species you see are horses and cows. However, those animals, which we are used to seeing in enclosures, walk free all over the island. They eat grass where they find it, they drink from the natural holes in the rocks and lakes, they copulate and give birth when nature calls, and they die where death strikes (Bimbino and Bambina saw a few skeletons during their hike). Anakena is the bigger of the only two sand beaches on the island, but is rather small itself. The rest of the coastline consists of huge volcanic rock pieces. 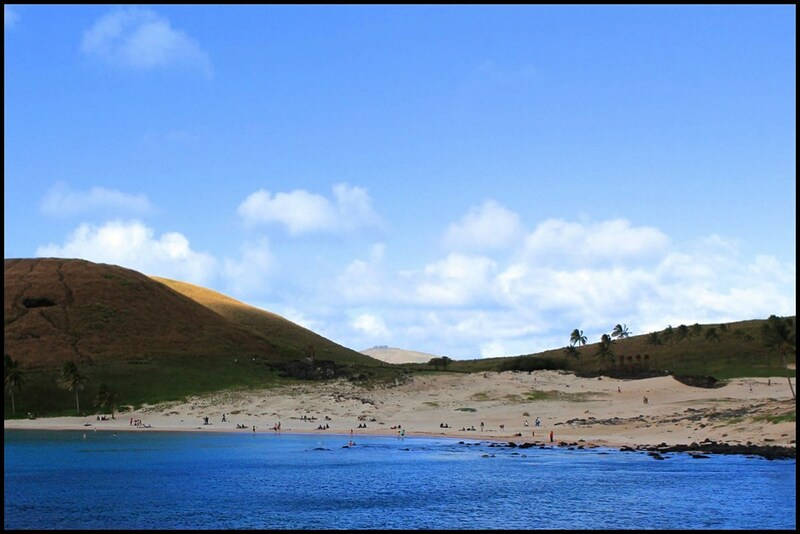 It is a small paradise at the slope of a volcano with white sand, palm trees, blue water of the ocean and the seven Moai watching over you. Anakena Beach on Easter Island. 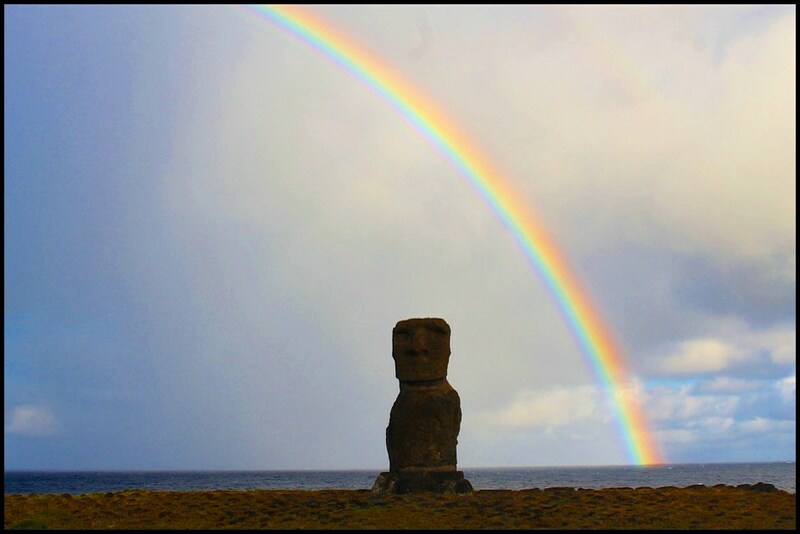 Volcanoes, sunsets, rainbows, waves, and horses would not have been so special if not for the Moai. The statues create an atmosphere of mystery and fill the landscape with their grandiose silhouettes. They just stand and carry on their eternal watch. The Moai stand guard on Rapa Nui. Getting to Easter Island is no longer very difficult. Flights from Santiago de Chile leave twice a day. The costs may be a barrier, keeping some people away. However, if you book in advance, you can find a return flight for about $550. Moreover, if you buy a ticket from the local Chilean LAN website, you may even be able to get it for $400! The only problem might be understanding Spanish. Easter Island is very expensive. Almost everything sold there gets imported from the continent and transported on the very same aircraft you fly in with. You can bring 23 kg of check-in baggage and 8 kg of carry-on baggage. We advise to use this opportunity to the fullest to bring food and (if you need) drinks. 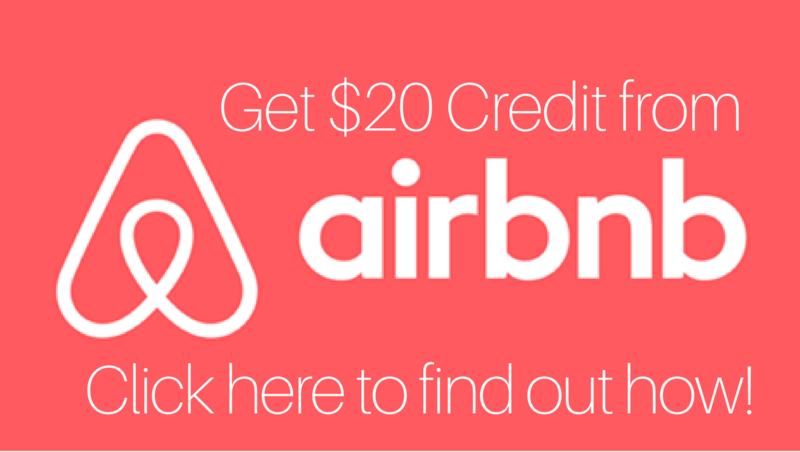 This way you can save a lot of money, as hostels and camping places (not hotels!) usually have cooking facilities. Easter Island indeed looks wonderful. Is it in your bucket list? Inga and Florian are adventurous travelers, friendly hitchhikers, and passionate Couchsurfers. 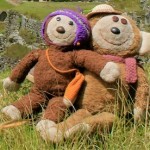 They traveled for one year in South America in 2013, where they started working on their Travelling Monkeys project (do support them on GoFundMe!). They not only take pictures with Bimbino and Bambina everywhere they go, they also make monkeys for other travelers! They are now based in Germany and getting ready for their RTW trip in 2 years. Follow them on Facebook, Instagram, and Twitter. I’ll file this under “Expensive-But-Oh-So-Worth-It.” It’s just so mysterious and magical, feels like you’re in one of those far-flung planets in Star Wars! Easter Island is on my list, and I’m glad you mentioned they have flight options available! I’m prone to seasickness, so I try to find opportunities to avoid boats. I loved your pictures and I think the monkeys are a great addition to your photos. Just WOW! Yes, with capital letters! You are so lucky to have visited Easter Island! The scenes are fantastic, and we would definitely love hiking there! All of your photos are lovely but the two monkeys viewing the sunset is beyond adorable. 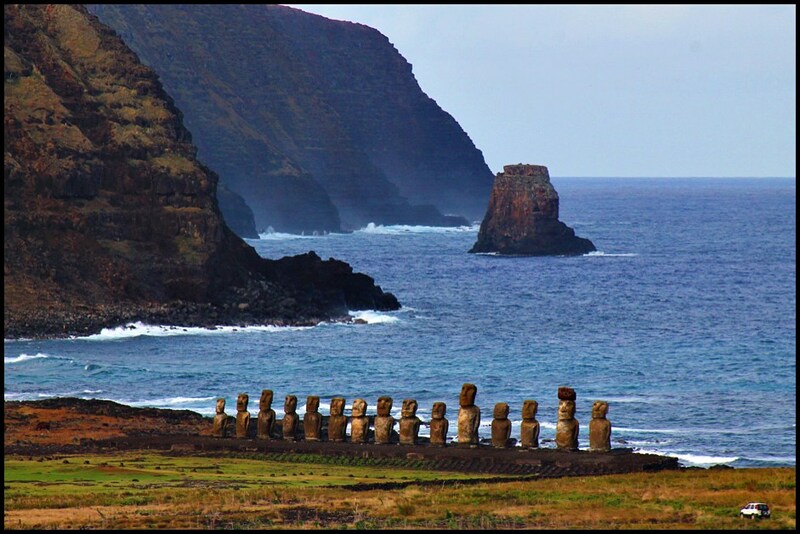 Easter Island isn’t on our radar, but it sure looks amazing! Easter Island is on our bucket list together with Father stones of Jeju island, and Stone Henge in UK. Hope to visit this one day. 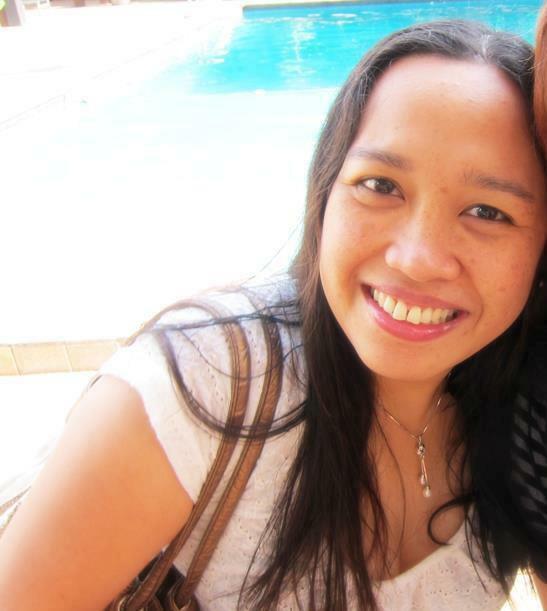 Love such far flung destinations. It really is farflung…and expensive. Hope to visit someday.